A ground-breaking way to fund international space projects, which makes space exploration available to the public, is launching today (January 24) during the World Economic Forum in Davos, Switzerland. A community-led crowdfunding platform run by Spacebit, under the watchful eye of a team of consultants, astronauts, engineers and rocket scientists, will enable the public to vote on large scale space exploration projects. The Spacebit Foundation has been developing and building an ecosystem to allow people and small enterprise to take advantage of recent giant leaps in launch technology and satellite platforms for five years, and has already gained support from top scientists, industry leaders and public figures. Today marks the launch of a new platform, on which the public can participate and financially support future space missions. Spacebit has strong, existing financial backing from venture capital. From now on and for the first time, individuals can fully and financially participate in the project, becoming part of this new space community. Once launch costs are met, Spacebit will begin the next exciting stage of its vision: The first publicly crypto-funded space mission. Spacebit will propose several missions to its community of participants. The missions to the Moon are currently being developed and will include a lunar drone mission to explore the volcanic caves and to put a radio telescope on the back side of the moon using a rover and utilising a lunar orbiting satellite to relay the data back to Earth. 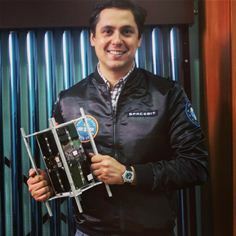 Spacebit is a unique space company with offices across the globe. Spacebit is changing the way large space projects and missions are funded. Its ultimate goal is to democratise space exploration, unshackled by state or national sponsorship, which allows everyone to participate in the future of humanity in our universe. For more information or to join the Spacebit community visit, www.spacebit.com. Founders of Spacebit are in Davos for the launch which takes place at 22.00 on January 24 at the Hub Culture Pavilion, Promenade 93, 7270 Davos Platz, Switzerland. Interviews and a Q&A sheet are available on request. Spacebit brings involvement in space access and space exploration to ordinary people by using blockchain technology to crowdfund large space projects. It not only enables a new way to fund space exploration, but also acts as a conduit between people and exciting new space projects.